What happens when a total starts taking a nosedive and the point spread stays mostly idle? My advice is usually to smash that Under while you can or stay far away from what is sure to be a tense evening sweating your bet point by point and possession by possession. That's what we've got tonight with No. 1 Gonzaga going up against rival Saint Mary's in the West Coast Conference final. The total opened at 142 and by noon ET was down to 139 -- with indicators from offshore books suggesting the number will continue to drop throughout the day. It's not a total surprise, considering that -- as Tom Fornelli wrote yesterday -- conference championship Unders are a fairly successful system play for many and also because both of the regular season meetings between these two teams went under the total set by the oddsmakers. 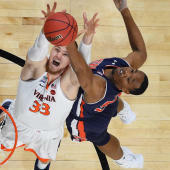 Play our conference tournaments bracket game to pick who wins in the ACC, Big 12, Big East, Big Ten, Pac-12 and SEC tournaments. Yet the point spread for the game has held tight, right at Gonzaga -14.5. The top-ranked Zags walloped Saint Mary's by 48 at home in the first meeting (covering the spread) and then won by 14 at Saint Mary's on March 2 (again, covering the spread). Underdogs are often undervalued in conference tournaments and a third meeting in just over a month figures to play in Saint Mary's favor, but I can't advise stepping in front of Gonzaga's offense -- on the total or the point spread -- given the insane efficiency and production by this year's team. After an encouraging 12-5 start to the season that included wins against Louisville and Florida State, Jeff Capel's first Pitt team regressed to preseason expectations during a 13-game losing streak through most of conference play. When trying to handicap how such teams might perform in the conference tournament, personnel and the state of the roster plays a huge role in determining motivation. Pitt has the younger team with three freshman starters, all of whom are sure to be key to Capel's big-picture rebuilding efforts. Boston College is a veteran-laden team that -- for better or worse -- has always been one of the first teams in action at the ACC Tournament. Give me the young bucks with dynamic point guard Xavier Johnson leading the way in a win and cover for Panthers. Want another pick? Visit SportsLine now to see which side of the Horizon League Championship spread cashed in on over 60 percent of our simulations. Hofstra is one of the best shooting teams in the country on the season -- No. 7 in effective field goal percentage, No. 8 in three-point percentage and No. 2 in free throw percentage, per KenPom -- but what we see with this line is oddsmakers recognizing that the Pride are a different team now than when it rolled off 16 straight wins earlier in the year. Part of that might be the inability to cover the spread in five of their last six games, but also recognizing that Hofstra's six-man rotation might be running out of gas. Justin Wright-Foreman needed 42 points to made sure Hofstra didn't get upset by Delaware in overtime on Monday night, and it's tough to imagine that effort can be replicated against a better team in Northeastern. Fantasy more your style? You're going to want to check out DFS millionaire Mike McClure's top NBA DFS picks for today. They're up at SportsLine now! On one hand, you could favor Johnny Jones and the up-tempo Texas Southern Tigers to blow the doors off Southern as revenge for the home loss just a few days ago in the very same arena that's hosting tonight's quarterfinal matchup. After all, Southern is ranked No. 337 of 353 Division I teams in the KenPom rankings and Texas Southern was already locked into the No. 2 seed for the conference tournament well in advance of that game. But I'm breaking the other way, assuming that Southern will be able to use that 10-point win as a source of confidence as they return to the same building albeit with very different stakes. Texas Southern won't lose -- there's too much on the line here in a one-bid conference tournament -- but Southern, with its slow pace to combat what Texas Southern wants to do, can cover this big number. One more pick? Gonzaga vs. St. Mary's has a side of the total that's looking like a winner in the West Coast Conference final, cashing in 83 percent of simulations. Find out which side of the line and total to pick based on our highly successful computer prediction model at SportsLine now.